What State is Mr. Rasouli in? While Mr. Rasouli had been comatose for a few years, it isn't as if his condition has remained static. In fact, he was recently upgraded from “vegetative” to “minimally conscious”. As its name suggests, those who are in a minimally conscious state (MCS) are conscious, albeit in a limited fashion. It is notoriously difficult to decide how “much” consciousness a patient with MCS has. It is also important to remember that Mr. Rasouli is not “dying” from any terminal disease, and that the life support is not putting the kind of unbearable stress on his body that is discernibly detrimental. Why Remove the Life Support? If Mr. Rasouli is minimally conscious, then what is the point of removing his life support? The doctors argued that it should be removed because it wasn't providing any medical benefit to him. This is true in a sense, but we should probe deeper into this: what kind of “benefit” is the life support providing? Catholic bioethical principles are helpful in making sense out of these situations. As is outlined in the Declaration on Euthanasia published by the Congregation for the Doctrine of the Faith (CDF) in 1980, there are two kinds of treatments or procedures: extraordinary and ordinary means. We receive extraordinary means because of our sickness. We won't need it if we are healthy. For example, cancer treatments and heart bypass surgeries fall into this category. On the other hand, ordinary means are treatments or procedures that are administered to preserve life. We are talking about basic things such as food and water, or a machine that helps a patient breathe. There are other nuances to our understanding of these two means, but such a description would suffice for our purpose. We can better see the difference between these two categories if we decide to remove them. If we don't have extraordinary means to help us with our sickness, then we will most likely become more and more sick, and eventually die from it. The cause of death will be the pathogen, whatever it may be. The removal of ordinary means is a different story: we will also die, but the cause of death is not the pathogen, but rather the lack of the most basic means that sustain our life. Its removal is a direct cause of death. Given these descriptions, it is not difficult to see that treatments with medical benefits are extraordinary means, while basic needs provided by life support are ordinary means. This is why the statement made by these doctors in question is medically correct, but for the wrong reasons: life support does not provide any medical benefit to Mr. Rasouli because it is not supposed to. Its role is to keep him alive, not to cure him from his neurological condition. This is an example of misunderstanding the role of life support, and using a false definition to construct one's arguments. In any case, a removal of Mr. Rasouli's life support will be his cause of death, and not whatever neurological trauma that he previously sustained. The case of Mr. Rasouli does highlight two things: It is first a call for a better understanding of medical treatments such as life support. Can we make the distinction between extraordinary means and ordinary means, or are we stuck with the broad-stroke description of “medical treatments”? Second, it is a real slippery slope we are witnessing: those who are conscious and aware only to a certain degree are not considered to have a life that is worth living. As with all matters of life and death, it comes down to how we understand the mystery that is suffering. Granted, there is nothing romantic about suffering, but it is not a meaningless event. How do we accompany and support those who are suffering? 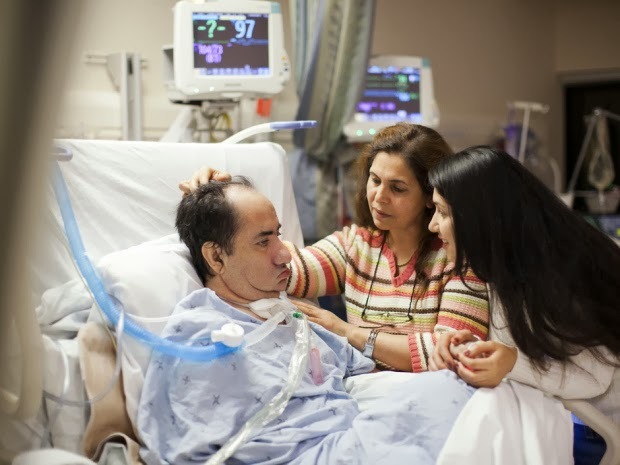 The care that Mr. Rasouli receives from his family offers a glimpse of hope.